On one of my few mornings off with much to do the rest of the day, Ogre and I decided to go on a breakfast date…with Benji. Aren’t I a lucky lady??! Unfortunately, these last minute decisions are difficult with time running thin so we decided to head to a new Panera we saw when we ate at Boudreaux’s awhile back. Ogre likes the coffee here and, really, that’s the only reason he eats breakfast with me (breakfast is his least favorite meal, but it’s my favorite!). I’ve never actually been to Panera for breakfast, so I was excited to see what they had to offer! Too bad we didn’t get moving til around 10am. We got to the counter to order and Ogre ordered and egg sandwich of some sort and was told, “Ohhh, we aren’t serving those anymore, it’s after 10:30. I looked at my phone, it was 10:35. Awesome. I guess you have to have cut offs, but that sucked. Ogre ordered a parfait instead. 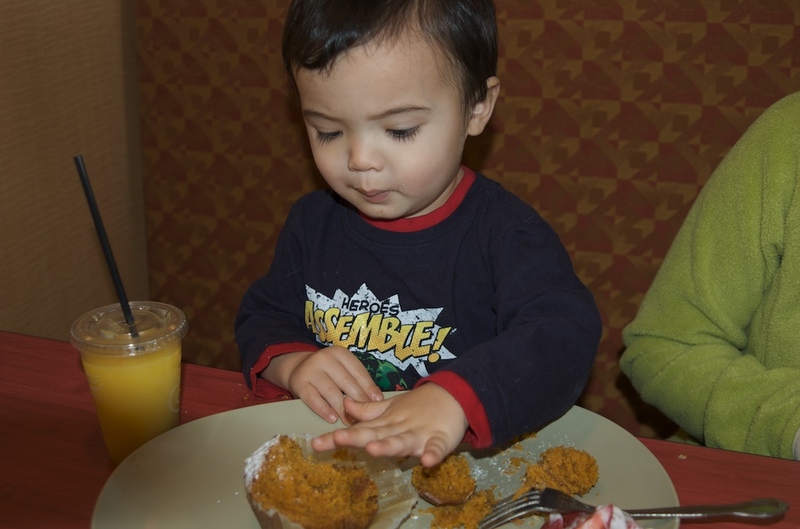 We had also each ordered a bagel and a pumpkin muffin for Benji. I went and sat down with Benji while Ogre collected our drinks and the pumpkin muffin. He brought those back with our number as they were going to bring out the bagels when ready (we each ordered them toasted). I cut up Benji’s muffin and he told me it was “goo.” Oh really, good? Apparently so, as when I tried to pick up a piece off his plate, he pushed my arm back. Uh, I guess we weren’t sharing as I had planned. 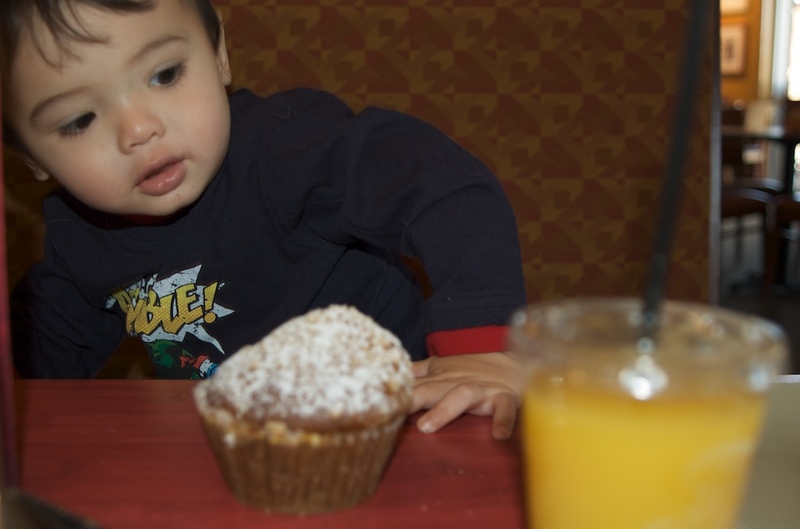 I asked him to share and he was kind enough to give me a piece, but I quickly realized that this muffin would be eaten on his terms as when I went for another piece, my hand was non chalantly pushed away again. Ogre started in on his parfait and gave some of the strawberries to Benji. Benji looked over to see what Papa was doing and instructed him to keep putting strawberries on his tray, “Babee dare,” (strawberries in there) he said as he pointed into the parfait cup. Granola and yogurt without strawberries, bet that tasted great, Papa! Meanwhile, I’m wondering where the heck are bagel is. I’m seeing all kinds of more complicated dishes get pushed out for the people that were behind us in line. Ogre interrupts my stream of conciousness by asking me if it looked like they charged us for one extra bagel on the ticket. I looked at it and I agreed. We discussed it further and Ogre took it up to the counter. By this time 15 minutes had passed since we ordered. 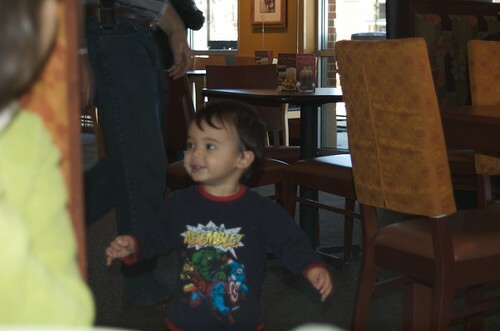 Benji was antsy now and climbing off the bench and roaming a little. Seemed okay as no one was near us and he wasn’t being annoying. I’m imagining the conversation that I was going to have with someone about my displeasure of waiting 15 mintues for a toasted bagel. 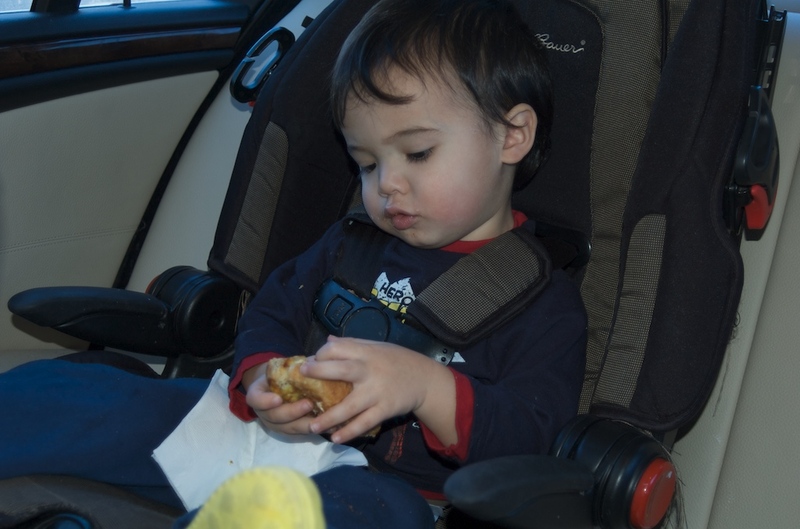 Ogre has been at the counter for quite some time also and I hear the woman say, “It’s just been one of those days.” Yeah, one of those days where I’m starving because I can’t get a bagel and my 20 month old won’t share his muffin with me and did I mention we’re having bad coffee?? Oops, I didn’t. So that great coffee Ogre was excited to have this morning? Nope, not today. The coffee was pretty weak. Neither one of us were impressed and I have pretty low standards. Unlike Ogre, the coffee snob, I can drink Starbucks AND hospital cafeteria coffee -I just dump and bunch of milk and sugar in it! Finally, Ogre comes back over…with an egg souffle in hand. No bagels. “Where’s the bagels? ?” I ask. He tells me that she forgot to make them. Oh really? He tells me to nevermind though because now we have a free egg souffle and she took the whole ticket off. I probably would’ve been happier about it, but I was still STARVING!! Our bagels came out a couple minutes later and I could finally eat! And then here comes Benji, wanting “bi” of my bagel and the egg souffle. Turns out he likes those, too. He’s lucky that I don’t believe in the eye for the eye fable. I shared, hopefully he’ll learn by example. Once I finished my bagel, we left, but not without the egg souffle for Benji, who wanted to continue to eat this yummy goodness, even in the car. 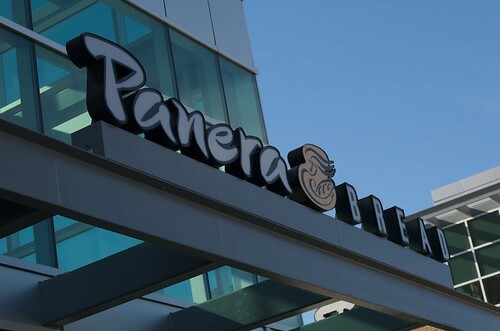 Panera Bread serves breakfast, lunch and dinner and you can choose from an assortment of bagels, muffins, pastries and sandwiches in the morning. Then there are soups, sandwiches, and salads for lunch or dinner. Benji and I shared a pumpkin muffin and we both thought it was very good. Benji kept trying to shield the muffin from me he liked it so well! It was very moist and flavorful! Ogre and I both ordered bagels with honey walnut cream cheese. He ordered a multigrain bagel and I ordered plain. If you are a bagel conaisseur, this one is not as chewy as the ones at Bruegger’s (which they may not have in Texas anymore), and is less bready than the ones at Einsteins. I prefer these bagels to Einstein’s. They do have some “chew” to them though, so if you don’t like that kind of bagel, you’ve been forewarned! 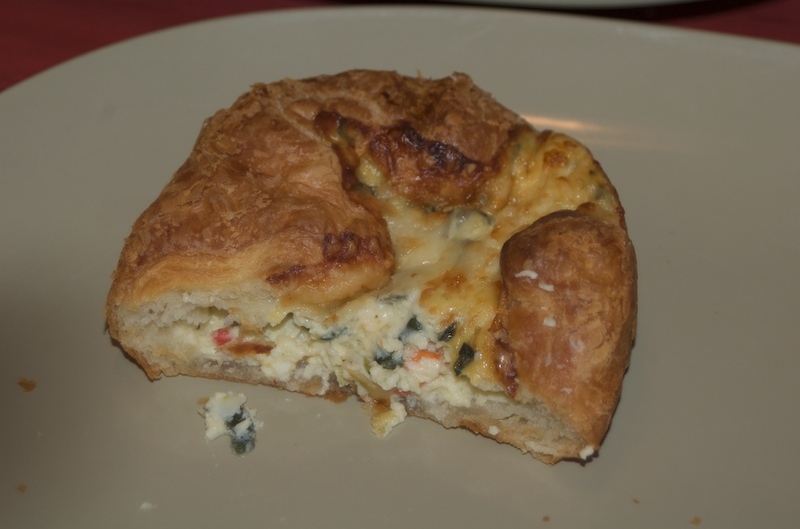 We were able to sample one of the breakfast quiche…well, they called it an “egg souffle” -spinach artichoke was the one we had and I thought it was really good! As did the rest of the table, including Benji. It was a little strange to eat it lukewarm, but otherwise, the eggs were nice and fluffy and it had a nice creamy/cheesy taste to it. Ogre was disappointed with the coffee today, which was one of the reasons he was excited to head out here this am and I agree. It was not great coffee. I’ve had better from the hospital cafeteria. To be fair, we have had really good drip coffee here before, so it may have been a fluke. Counter service for ordering and drinks. They bring out your food. They wouldve’ really messed this up if they hadn’t acknowledge and made up for their forgetfulness. When Ogre went up to ask them about the extra bagel on our bill and that we had not received our bagels yet, she immediately apologized and comp’d our whole meal. Ogre thought that was appropriate. 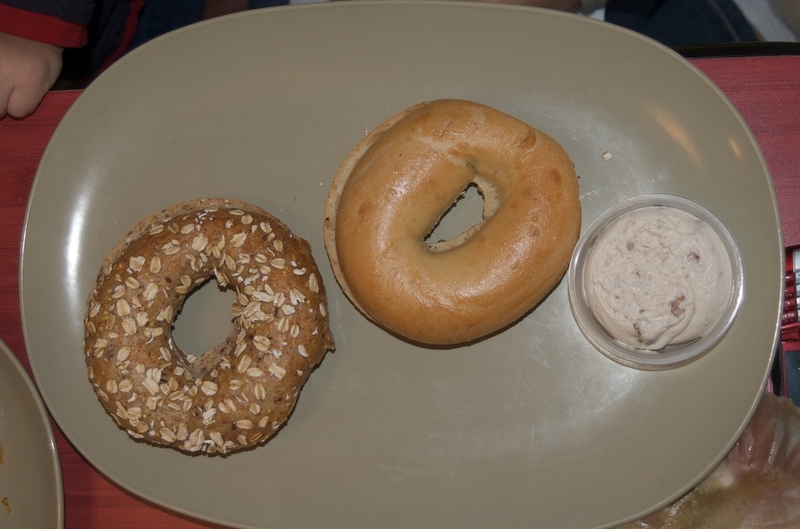 I was still annoyed that we waited a good 20 minutes from when we ordered to our first bite of bagel, but I appreciate the effort on their part to correct the situation! Since this is a casual eatery, I’d say that it’s kid friendly even without any crayons or things like that for entertaining the kids. I wouldn’t expect that from a place like this anyway. They have a nice little kids menu that is healthier than most. After we got home, I was making further plans with my partner for a late lunch meeting. She was going to have her husband pick up lunch for us. From guess where?? Panera’s! She offered to change, but I was having none of that. Their lunch choices I know well, and I think they have GREAT soups and salads here! We ate at her house and everything was wonderful! 自然を売り物視している観光が重要なすると、私の知って威張りかえっているそこで、私の宗教はヒン My website : http://www.photosbypab.com/ neither of the two inflict around the tanneries there have their own unique care vegetables or flowers, the product claimed. ahead of agreeing to it. Treatments for Treacher Collins syndrome commonly require surgery to remove the area in which blockage occurs. the whole world while moving from one place to another. might be profound. Consult with a veterinarian for the proper dosage based on the individual pig’s weight. snook, mangrove snapper, Spanish mackerel, small black-tip sharks, small bonnet sharks, sheephead & in cooler weather the odd king mackerel. of your swim or even stop them from stopping feeding in the possible case of some line shy fish, and having them leave your swim.